You know one of the things that makes this world wonderful? Carbs. And you know what makes it especially wonderful? Carbs with cheese. And this is what we have here. 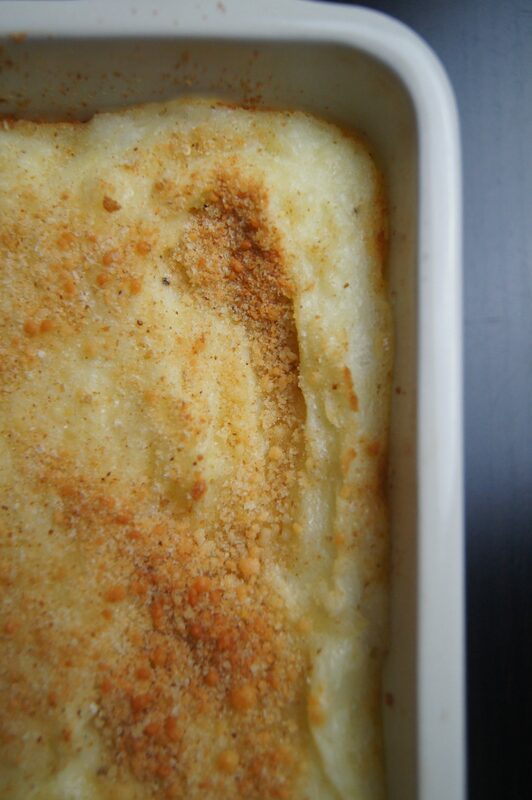 Mashed potatoes on their own is pretty spectacular, but when you add cheese to the mix AND bake it with parmesan breadcrumbs so you get a crunchy topping…whoa. It goes beyond happiness. It’s sheer nirvana. 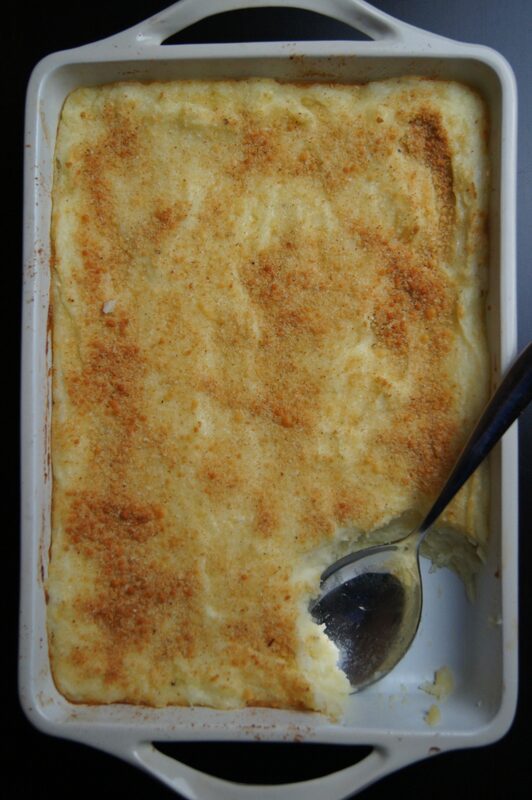 I usually only make these baked mashed potatoes on Thanksgiving and occasionally for Sunday dinner to go along with Absolutely Perfect Roast Chicken (http://www.thetastypage.com/absolutely-perfect-roast-chicken/). So it’s definitely a treat at our house and makes any holiday or special occasion all the more special. 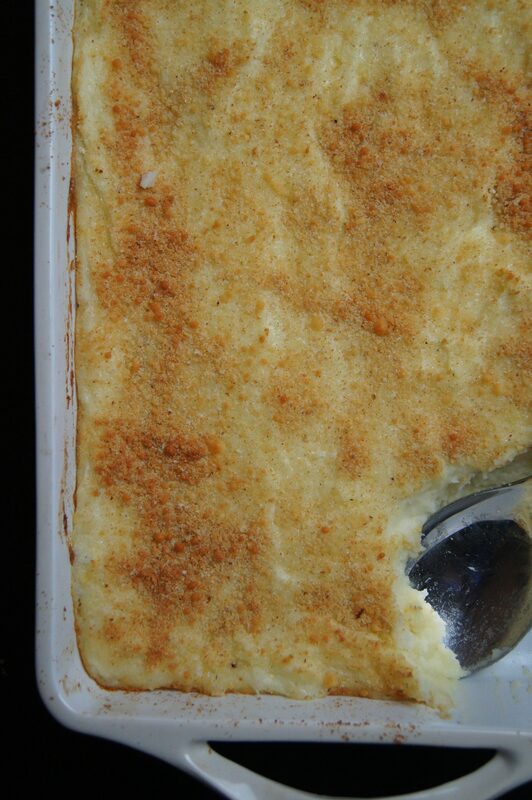 You can prepare these baked mashed potatoes with mozzarella and parmesan bread crumbs the day before and when you’re ready to serve them, just pop them in the oven while your chicken or turkey rests. 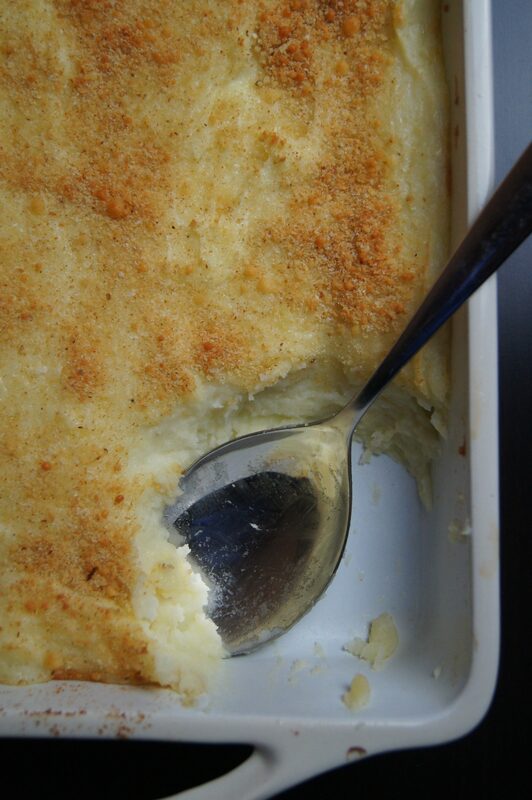 Practically everyone has a preference on how they like the texture of their mashed potatoes. Some like it nice and smooth and some like it lumpy. I like to make these potatoes with both elements; predominantly smooth with a just bit of lumpiness. To do that, I mash the cooked, cubed potatoes with a potato masher first to break them down. Then I’ll use my hand blender at the lowest speed when I add the milk and melted butter. I’ll only use the hand blender for a few seconds, just to incorporate the milk and butter, and to keep a bit of lumpiness. Next, I use a wooden spoon to fold in the cheeses. I once overmixed the potatoes with the hand blender and the potatoes got a little gummy. Luckily, I had two extra potatoes. I boiled them and added them to the mix. It fixed the gumminess and it also meant that there were even more potatoes to enjoy. So not a bad thing. If you’re not hosting Thanksgiving, or any other special occasion, but are bringing a side dish, these potatoes are perfect. They’re easy to transport and everyone will love you all the more for bringing them. 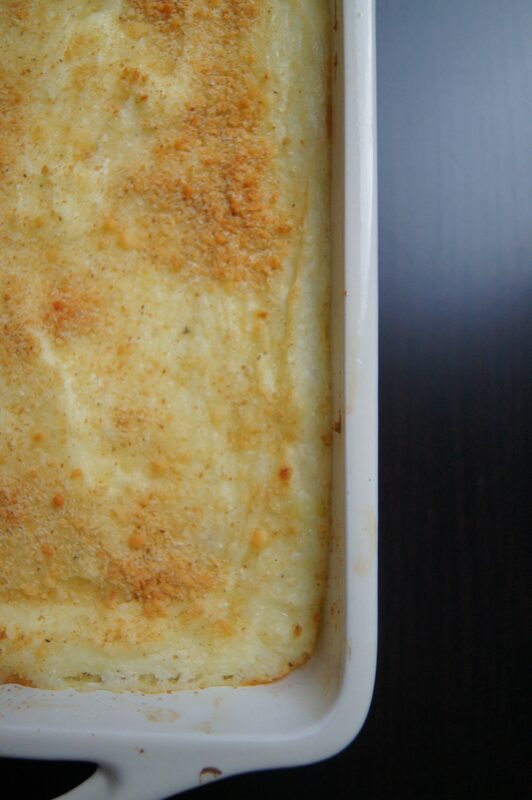 Potatoes and cheese – what’s not to love? You can pop the dish in the oven while you enjoy a glass of wine. Or two. I’ve said before that comfort food is like a hug. These baked mashed potatoes with mozzarella and parmesan bread crumbs are that warm, fluffy, cheesy hug that everyone needs from time to time. And these potatoes are perfect to enjoy with your family and friends since it adds more love and joy to your gathering. Cook the potatoes in a large pot of boiling salted water until they are very tender, about 15 minutes. Drain; return the potatoes to the same pot and mash well with a fork or potato masher and/or hand blender, until to desired lumpiness and/or smoothness. Mix in the milk and melted butter. Mix in the mozzarella and 3/4 cup of the Parmesan. Season, to taste, with salt and pepper. Transfer the potatoes to the prepared baking dish. Stir the breadcrumbs and remaining 1/4 cup of Parmesan in a small bowl to blend. 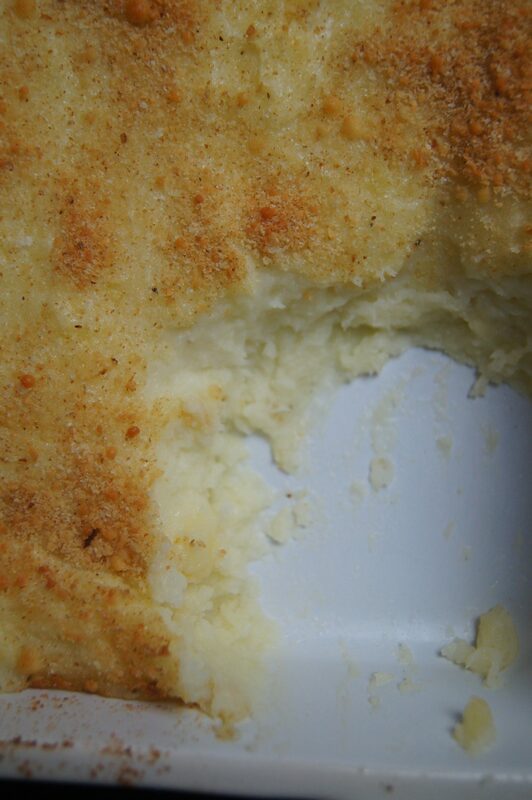 Sprinkle the bread crumb mixture over the mashed potatoes. Recipe can be prepared 12-24 hours ahead of time; cover and chill.